One of the signal failures of the media throughout the Trump dumpster fire of a campaign was to focus on his words — parsing, shifts in terminology, trying to distinguish between lies and hyperbole, or simply providing theater criticism on his performances, connections to audience and so on. All the while, the critical information: what the combination of his ample history, the (few) clear positions he staked, and the people he hired revealed about what Trump would actually do as President. It works like this: Donald Trump, the president-elect himself, says something that sounds like he might be moderating on the issue. Then, his staff takes a radical action in the other direction. Last week, Trump told the staff of The New York Times that he was keeping an open mind about the existence of climate change. A day after Trump talked to the Times, The Guardian reported that the Trump administration plans could cut all of NASA’s Earth science research…. …which, as many have already noted, is vital for ongoing climate monitoring and ongoing attempts to study the implications of human – driven global warming with the resolution needed to inform action. Politico reports that the Heritage Foundation senior research fellow, Steven Groves, has been added to Trump’s State Department transition team. Just last week, Groves called for the United States to leave the UN Framework Convention on Climate Change, the overarching treaty that governs how the world organizes itself to address global warming. Groves also said the U.S. should move to “dismantle” domestic climate regulations. Thus, a picture of a Trump administration policy on climate change: destroy the research infrastructure needed to study climate, and wreck both national and international prospects for action to address what a true existential crisis. The moral, to use Meyer’s phrase, is that Trump is a master of the two-step, baffling the unwary (aka, seemingly, the entire New York Times staff) while proceeding behind that verbal smokescreen towards the worst possible choices. We need a much more vigilant press, and a brave one. 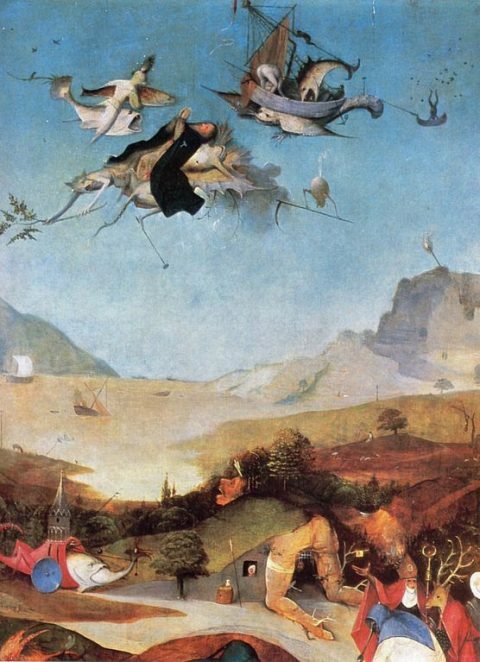 Image: Hieronymous Bosch, The Temptation of Saint Anthony (left panel detail), 1495-1515. Not an exact match to the post, but I’m kinda just looking for apocalyptic images these days, and this certainly works for that. This entry was posted on November 28, 2016 at 4:12 pm and is filed under climate, Science Policy, Trump Crime Syndicate. You can subscribe via RSS 2.0 feed to this post's comments. You can comment below, or link to this permanent URL from your own site. Excellent post, but now I’m more terrified of Trump than ever.. Always watch carefully what the man behind the curtain is doing. The pattern is clear by now. Trump or one of his creatures does something appalling, and before the media can sink their teeth in, he releases a tweet that is so mad that it gets all the publicity and people forget the substantive damage done. This will be the pattern until 2020, so get used to it.